With the Grand National now two months away the excitement for the great steeplechase is hotting up. This year’s Grand National received a massive 112 entries, with a record-breaking 47 being from Ireland. The final line-up will be announced next week at the weights lunch in Liverpool. There are plenty of familiar faces from the racing world all bidding for a Grand National title. Lambourn trainer Jamie Snowden is too thinking about his chances at Aintree Racecourse with horse Fact Of The Matter. The 9 year old Gedling owned by The Sandylini Racing Partnership will first be making his mark over the cross country fences at Cheltenham Festival. Although entered into the Grand National the decision whether to make Aintree a target for the horse is said to depend on his performance in the Glenfarclas Chase next month. Snowden stated that although “Fact Of The Matter is rated 140, the Grand National weights are framed differently meaning the wins over cross country fences could work in his favour”. The Snowden Yard enjoyed an impressive season last year which has lead them on a successful path providing more opportunities. The 2017/18 season saw Jamie Snowden achieve back to back wins totalling up an impressive 35. A highlight for them from last year includes the victory of Carntop at Worcester. The Snowden team have already made impressive strides to continue their success this year and the race at Cheltenham is highly anticipated. It would be great to see the transition from Cheltenham Festival to the Grand National for Fact Of The Matter and his connections. Other trainers that have opted for this route include the likes of Gordon Elliot and Willie Mullins. Elliot has seen success at both Cheltenham and Aintree. In total Gordon Elliot has trained 14 Cheltenham Winners and two Aintree winners. The most recent one being 2018 winner Tiger Roll. In 2018 Willie Mullins became the most successful trainer at The Festival with 61 wins, an amazing achievement right? Both have entries for the Grand National this year and we can’t wait to see what both teams will bring to Aintree. There’s no doubt that both Cheltenham and Aintree are major highlights of the racing season. 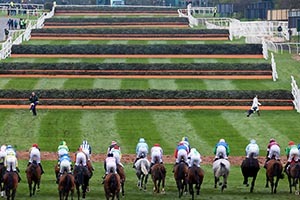 The Grand National is by far the world’s greatest steeplechase attracting a mass of visitors and viewers year on year. We are thrilled to provide VIP hospitality to Aintree again this year in our exclusive Silks Restaurant facility. You and your valued guests can enjoy exclusive hospitality making it a race day experience worth savouring for all. See your favourite trainers, jockeys & runners in action in sublime style as you enjoy the finest hospitality. 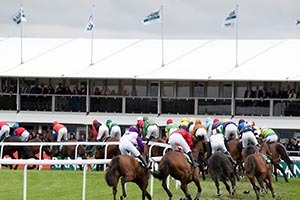 Book VIP Hospitality at Grand National for 2019.